A simple white flag, the name CAMBRIDGE prominently written in blue in the lower half, toward the fly. 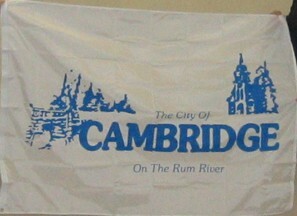 Above in smaller letters "The City Of" and below "On The Rum River". Above the name are local scenes, but are not easily identifiable.